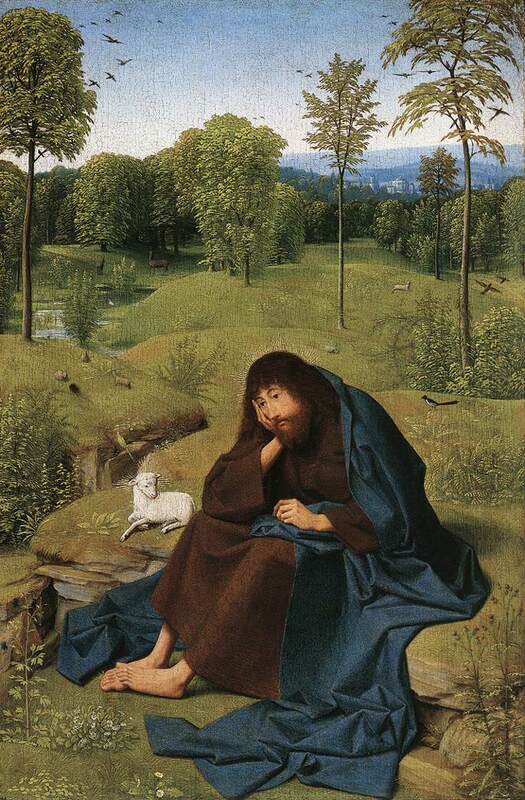 A very unusual and original portrait of John the Baptist in the wilderness, which was originally part of an altarpiece. This is the first painting in which Bosch’s idiosyncratic plants play a major role in the composition. (Saint) John the Baptist is a very popular figure in Christian religious painting, from the annunciation of his birth to his death by beheading. The Gospel of Mark establishes his role as the messenger sent ahead of Christ, and that he was a ‘voice crying out in the wilderness’. During his time in the wilderness, John is described as living on locusts and wild honey, and wearing rough clothes made from camel skin. He then came out of the wilderness to baptise Jesus Christ, so launching the latter’s ministry. John the Baptist’s attributes are a lamb (from his reference to Christ being “the lamb of God” during his baptism), camel skin robes, the cross, a scroll bearing the words Ecce Agnus Dei (‘behold, the lamb of God’, quoted from the Vulgate), pouring water from his hands or a scallop shell (baptism), and a platter bearing his own head (from his beheading). Hieronymus Bosch (c 1450–1516), Saint John the Baptist (c 1490-95) (CR no. 5), oil on oak panel, 48.5 × 40.5 cm, Museo Fundación Lázaro Galdiano, Madrid. Photo Rik Klein Gotink and image processing Robert G. Erdmann for the Bosch Research and Conservation Project, via Wikimedia Commons. 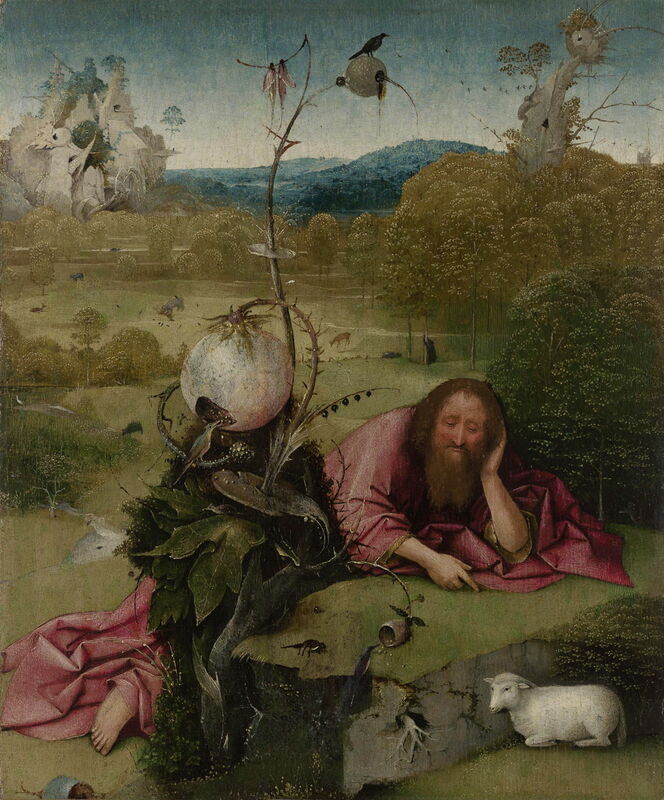 John the Baptist is reclining in thought on a slab in a wooded landscape, which contains several strange and unnatural structures. John leans along a diagonal in the lower half of the panel. He wears long red robes, covering him entirely apart from his head, hands and forearms, and his right foot. His head is propped on the heel of his left hand, and his right hand is pointing with the index finger to a white lamb, which is at the lower right corner. He is also looking down at that lamb. He is balding, with long hair and beard. Where his arms emerge from the robes, an undergarment can be seen, which may be coarse and of animal hair or skin. The lamb is resting on its ventral (under) surface, on the ground, just below the slab on which John is leaning. In heraldic terms, this attitude is couchant or lodged. At the corner of the slab nearest the viewer, near the centreline of the panel, a bird is eating small seeds which are spilling out from a cup-shaped fruit, attached to a thorny branch. Below that a root is breaking out of the side of the slab. To the left, a dead bird rests on the top of the slab. Passing just to the left of the midline, and obscuring much of John’s body and legs, is a strange column of vegetation. At its base is a bush, with distinctive leaves. Several thorn-bearing branches curve out from that. One connects to the cup-like fruit described above. Another passes vertically towards the top of the panel, where it forks into one branch, which bears another spherical fruit on which a bird is perched, and a second branch from which two flies (mayflies, probably) are hanging. Another branch terminates in a very large spherical fruit, larger than John’s head, which has a hole in its lower reaches. Another bird is feeding from seeds within that hole. At the foot of this bush is a small mammal, possibly a mole. The middle ground behind this is a deer park, in which there are scattered trees, and a dense wood on the right. In the open, undulating areas of grass are several deer feeding, a deer (or similar) being eaten by a wolf or bear (with attendant crows for the carrion), and a small lake with a grey heron. At the edge of the wood on the right, a black bear is shaking the base of the trunk of a tree. In the distance are rolling, wooded hills. In the background on the left are the ruins of an old building which have partly been taken over by strange plants and other forms. On the right, there are the large hollowed-out remains of an old tree, on which a human-like figure, possibly a bear or monkey, is climbing. That gives rise to thorny branches, on which there are other large spherical fruits. In the far distance, at the right edge, is a castle. The sky is clear and blue. Setting aside for the moment the strange plants and other structures, this is an unusual treatment of an unusual subject. Domenico Veneziano (1400–1461), St John in the Wilderness (predella 2) (c 1445), tempera on wood, 28 x 32 cm, The National Gallery of Art, Washington, DC. Wikimedia Commons. 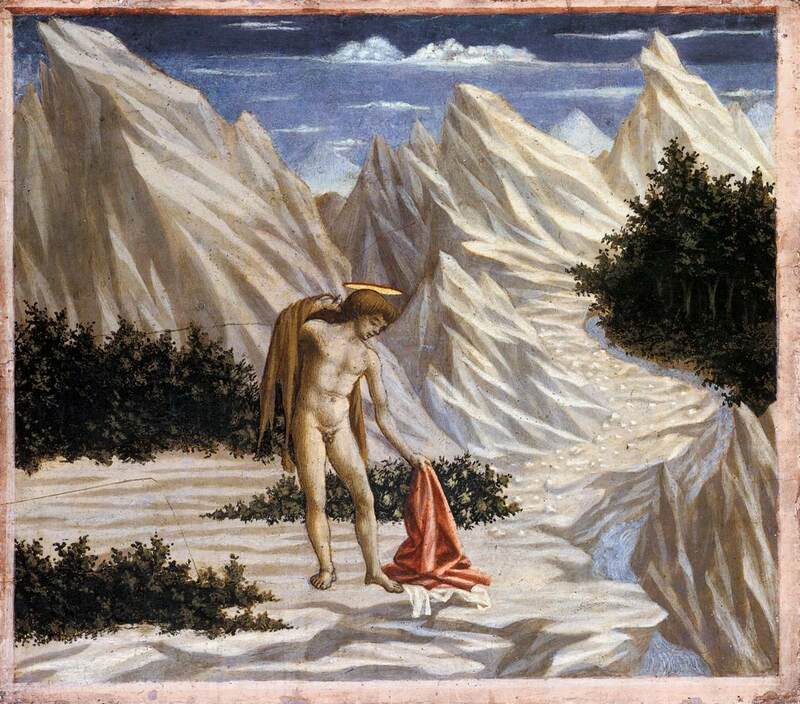 Earlier paintings, such as Veneziano’s St John in the Wilderness (c 1445), made the wilderness an arid and barren desert, and John appear ascetic, here apparently changing his red robes for camel skin. Geertgen tot Sint Jans (c 1460-1488), Saint John the Baptist in the Wilderness (1490-1495), panel, 42 x 28 cm, Gemäldegalerie, Berlin. Wikimedia Commons. Geertgen tot Sint Jans’ almost contemporary Saint John the Baptist in the Wilderness (1490-95) has many similarities, in the appearance of John, his resting his head on the heel of his hand (here the right, not left), and a deer park setting. John is also confined to the lower half of the panel, although he is here more upright and less diagonal. These similarities are remarkable, and suggest some influence between the artists, possibly that they used a common source such as a print. Titian (Tiziano Vecelli) (c 1485/1490–1576), Saint John the Baptist (c 1555), oil on canvas, 195 × 127.5 cm, Museo Nacional del Prado, Madrid. Wikimedia Commons. 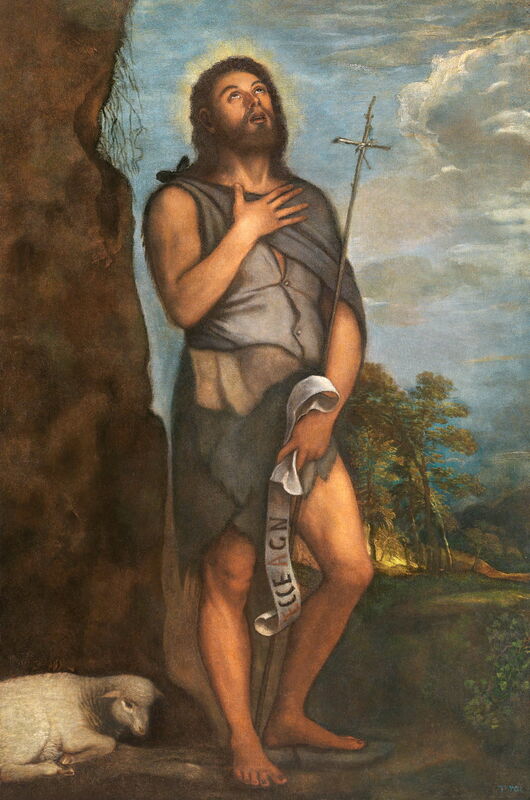 Titian’s much later Saint John the Baptist (c 1555) is quite different in its portrayal of John, and the dominance of his figure in the painting. 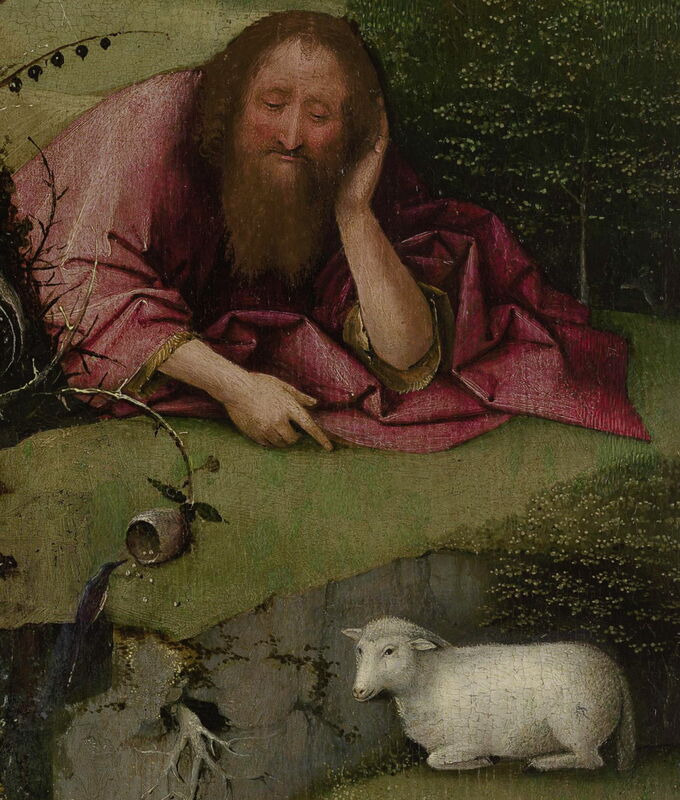 John the Baptist is readily recognisable as he points to his most distinctive attribute, the lamb. Those figures are beautifully executed, but otherwise unremarkable. The repeated plant motif, of thorny stems and branches leading to seed-containing spherical fruit, is sometimes ascribed to a fantasy based on the pomegranate. However the branches, leaves and fruit shown have little or nothing in common with the pomegranate, which in any case Bosch would never have seen as a plant, and very seldom even as a fruit. At that time, pomegranates were grown around the Mediterranean, far from ‘s-Hertogenbosch. The plant most likely to form the basis for these peculiar stems and fruit is the gooseberry, a species which Bosch would have known well, and may have been locally abundant. Otto Wilhelm Thomé, Ribes uva-crispa, in Flora von Deutschland, Österreich und der Schweiz (1885), Gera, Germany. By Kurt Stueber, via Wikimedia Commons. These illustrations by Otto Wilhelm Thomé (1885) show the great similarities in the leaves, thorny stems, and fruit of the gooseberry. 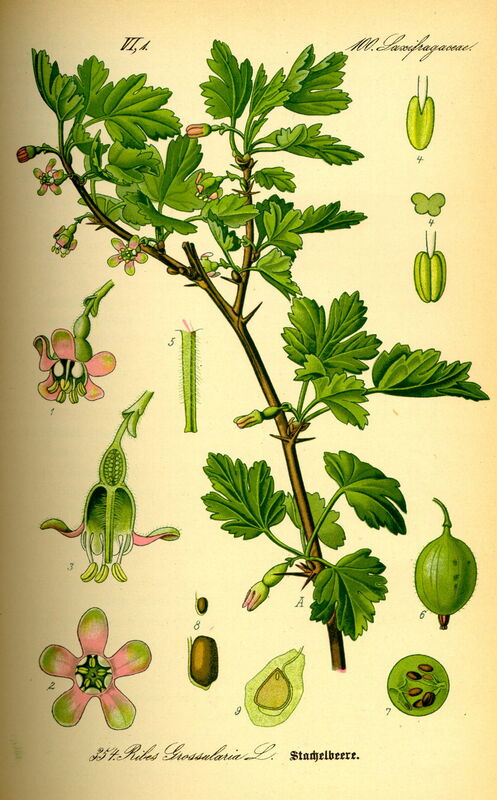 Symbolic associations of the gooseberry plant have not been well explored. There are quite rich associations in language and folklore: babies are sometimes described as being ‘found under the gooseberry bush’ instead of being born; to ‘play gooseberry’ is to be an unintended chaperone and obstruct a couple from courting; gooseberry blossom is sometimes said to symbolise anticipation. I do not know what local and contemporary lore may have been associated with gooseberries. Given that the largest and most prominent column of vegetation, in front of John the Baptist, was not part of the original painting (see below), but appears to have been added by Bosch at a later date, its presence may reflect his later more floridly symbolic style, as manifest in his later works such as The Garden of Earthly Delights (1495-1505). Therefore the current appearance of this painting may be a composite of his styles, and quite unlike its original state. As we do not know the identity of the donor or the reason for Bosch’s removal of his image, there are no clues as to when this alteration took place. Other details such as the ruin in the left background, the feeding birds, and the climbing bear/monkey/human, are also more prominent here than in his earlier works, such as Saint Jerome at Prayer (c 1485-95). The landscape setting has here grown quite overtly unnatural, sinister, perhaps even threatening, even before the donor was replaced by the strange bush and plants. Various religious symbolic interpretations have been proposed, but as hypotheses they are untestable, and most do not consider the changes made to the painting. It is in any case better to see how these potential symbols are developed in Bosch’s later paintings before considering such proposals. It is believed that, at its initial painting, the donor was shown where the plant and bush are, to the left of John the Baptist, and his face remains visible in infra-red reflectography now. 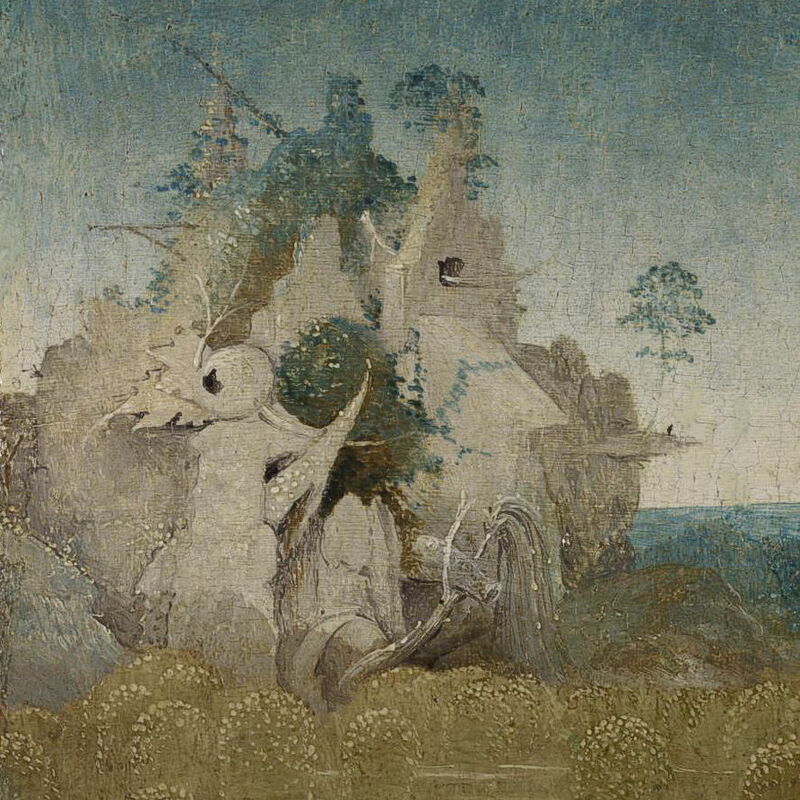 This was overpainted, almost certainly by Bosch himself, to show the prominent plant which now appears on the panel. This is almost certainly one of two panels created by Bosch for the altarpiece of the Brotherhood of Our Lady, Sint-Janskerk, ‘s-Hertogenbosch. This is thought to have consisted of wood carvings by Adriaen van Wesel in 1476-7, this painting and Saint John on Patmos (next article) by Bosch, and paintings by Gilles Panhedel in 1521-2. At a later date, the altarpiece was broken up into its separate panels. This painting was separated from a grisaille painting which would have been on its reverse, to be shown when the altarpiece was closed, by splitting the thickness of the oak, and the panel was cropped on all four sides to its present dimensions. Fuller details are in Ilsink et al. (2016), p 164. Posted in General, Painting and tagged Bosch, Geertgen tot Sint Jans, gooseberry, painting, pomegranate, Titian, Veneziano. Bookmark the permalink.